Department of Library and Information Science, Science and Research Branch, Islamic Azad University, Tehran, Iran. Purpose. This article examines characteristics of the external environment of library and information centres of Islamic Azad University in Iran, focusing on perceived environmental uncertainty and perceived source accessibility and quality, and their impacts on the amount of scanning and the frequency of information source use. Methods This research surveyed the library managers of ninety-four units of Islamic Azad University. Data were collected by a mail questionnaire with a response rate of 90.42%. Findings. Results show that there is a positive correlation between respondents’ perceived environmental uncertainty and the amount of scanning. Additionally, perceived source accessibility and quality are associated more with frequency of information source use in environmental scanning than with perceived environmental uncertainty; and managers mostly rely on personal and internal information sources. Conclusion. This research shows that: libraries as organizations are sensitive to their external environments, and variable, complex and important events occurred in it; managers of academic libraries feel uncertainty and complexity in their decision making and rely on information sources; and the use of library and electronic information services as information source in environmental scanning ranked in a high level compared to other sources. Today's universities are unique because they are scientific institutions where research is combined with education, and university libraries have an important supportive role in both education and research processes. Boyer (1990) addressed four key roles of the university: scholarship of teaching, scholarship of discovery, scholarship of application and scholarship of integration of scientific knowledge. Johnston (1998) maintains that all of these roles are the core business of universities. Academic libraries have an important supportive role in both educational and research process. Kuhlthau indicates that Academic libraries have an important supportive role in both educational and research process. Kuhlthau indicates that the university libraries' role consists not only of providing just in time access and delivery of information, but also of facilitating problem solving. Then she defines searching of iLike other libraries and information centres, academic libraries operate within the context of two environments: internal and external, which are interconnected. Whilst the internal context consists of organizational structure and functions and the way they are configured in pursuit of specified organizational objectives, each library also operates in complex and changing external environments, which frequently produce new challenges that need to be controlled to ensure the library’s future survival and success. Their impact is a two-way process: changes in the external environment affect the organization’s internal environment, whilst decisions made at managerial level will impact upon both the external and internal environment (Bryson 1990). Changes in the world of information are even more radical. Academic libraries are in transition because of changes in the context of higher education. Smith (2006) believes that today's academic libraries disseminate information to their patrons very differently than they did a generation ago. Then he describes eight ways in which academic libraries have shifted: from amassing collections of paper-based monographs (analogue) to digital formats; from books to journals and other media; from highly accessible on-site storage to compact storage, whether on- or offsite; from local storage to remote access; from local ownership to subscription-based access; from selection of individual items to selection of aggregate resources; from library-specific collection development to group-based resource sharing; from active acquisition of grey literature to free access via the Web. These approaches show that libraries' environment is a complex environment and decision making for their managers is very difficult. This study focuses on the selection and use of information sources to scan the environment by managers of library and information centres of Islamic Azad University units. The authors examined how managers' perceptions of environmental uncertainty, source accessibility and source quality influence their use of information sources. Managers' work is information-oriented. Managers are exposed to a huge amount of information from a wide range of sources and selectively use the information to make day to day decisions and to formulate longer term strategies. The external environment of an organization offers constraints and opportunities, and a firm's competitiveness, success and survival depend on its ability to monitor and adapt to environmental conditions (Lawrence 1981). This study focuses on the effects of perceived source accessibility and perceived source quality on the use of information sources in environmental scanning activity by managers of academic libraries of Islamic Azad Universities of Iran. The conceptual framework for investigating these research questions is constructed on theoretical foundations in organization theory, and information needs and uses studies. Taylor (1991) suggests that a more complete picture of information seeking by a group of users may be gained by analyzing their information use environment, which comprises sets of people, dimensions of the problems to be solved, the work setting, and the ways problems are considered to be resolved. Jurasek (2008) identified several trends that will shape the future of academic libraries: new generations of learners, learning spaces, learning and information literacy, technology, scholarly information systems and publishing, digital archives and repositories, campus and community cultural events, workforce, and policy, financial support and accountability. Research on environmental scanning first appeared in the 1960s with two pioneering studies by Aguilar (1967) and Keegan (1968). Information sources used in environmental scanning activity is one of the past research objects. Others include: the effect of perceived environmental uncertainty on scanning; environmental sector scanned, and scanning methods. Previous research found that managers who perceive great environmental uncertainty tend to do more scanning (for example, Nishi et al. 1982; Daft et al. 1988; Auster and Choo 1992; Ebrahimi 2000; Hosseini 2010). The focus of scanning activity is related to all market base environmental sectors with information about customers, competitors, and suppliers being the most important (for example, Jain 1984; Ghoshal and Kim 1986; Lester and Waters 1989; Hosseini 2010). The information source category used most frequently is personal information sources (O'Connell and Zimmerman 1979; Kobrin et al. 1980; Auster and Choo 1992, 1993; Choo 1993; Hosseini 2010), and the scanning methods can range from ad hoc informal activities to systematic formalized efforts based on organization's size, its experience, and its perception of the environment (Thomas 1980; Klein and Linneman 1984; Preble et al. 1988). As noted, previous research indicates that the perceived uncertainty of the environment is related to the amount of scanning done. When the managers experience a lack of information about a variable and complex external environment, they feel uncertainty and do more scanning activity for information. Thus we identify perceived environmental uncertainty as an independent variable that would affect the managers' scanning behaviour. On the other hand, information seeking involves both selection and use of information sources. Auster and Choo (1994) listed some studies about information needs and uses which found that users prefer sources that are perceived to be more accessible rather than those perceived to be of higher quality. They also introduced studies that examined how the perceived quality of information from a source may influence its use including Halpern and Nilan (1988), Nilan et al. (1988), Taylor (1986) and Zmud (1978). 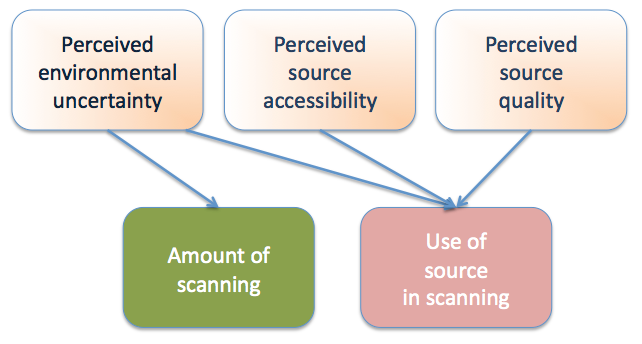 In this study we wanted to examine perceived environmental uncertainty, perceived source accessibility and perceived source quality as variables that influence the amount of scanning and the use of information sources to do the scanning. Then we developed our study model to illustrate our study's conceptual framework (see Figure 1). The authors surveyed the study population, which consists of library and information centres' managers of large and very large units of Islamic Azad University. Established in 1982, Islamic Azad University is a non-profit university in Islamic Republic of Iran that has 1,700,000 students, 35,000 faculty members, in over 400 university branches and educational centres located in different cities all over the country (Islamic... n.d.) To control the impact of organization size on scanning behaviour we selected large (33) and very large (61) units. The number of faculty members, number of students, research activities, educational activities, facilities and library size are the important criteria for identifying units. Data were collected by a questionnaire posted to all the managers identified. Of the 94 managers, 85 returned questionnaires, giving a response rate of 90.42%. Q1: Which sectors of the external environment of academic libraries of Islamic Azad University are perceived to be variable by respondents? Q2: Which sectors of the external environment of academic libraries of Islamic Azad University are perceived to be complex by respondents? Q3: Which of the information sources was used with a high frequency for the scanning of environment by managers? H1: Perceived uncertainty of an environmental sector will positively correlate with the amount of scanning in that sector. H2: The perceived source accessibility of an information source will positively correlate with the frequency of its use in environmental scanning. H3. The perceived source quality of an information source will positively correlate with the frequency of its use in environmental scanning. H4. The perceived environmental uncertainty will positively correlate with frequency of using each information source in environmental scanning. In order to measure perceived environmental uncertainty, the external environment is divided into six sectors, as defined in previous research by Daft et al. (1988) and Choo (1993): customer, competition, technology, regulatory, economic and socio-cultural sectors. Customer sector refers to those institutions or individuals that use the services offered by the respondent's library and information centre, and include companies that use library services and products. Competition sector includes the institutions, products and services, and competitive tactics; institutions that make substitute services and compete with respondent's library, and competitive actions between the respondent's library and other organizations in the same industry. Technological sector includes the development of new techniques, innovation and methods in offering information services to customer, and general trends in research and science relevant to the respondent's library. Regulatory sector includes government legislation and regulations, community policies, and political developments at all levels of government. Economic sector includes economic factors such as income rate of individuals, inflation, unemployment rate, and the economic growth rate. Socio-cultural sector comprises social values in the general population, the work, ethics, Islamic base ethics, and other demographic and cultural trends. Perceived environmental uncertainty=perceived variability of each environmental sectors + perceived complexity of each environmental sectors. Then, respondents assessed the variability of each of the six environmental sectors by answering the question: What is the rate of changes taking place in each environmental sector?. They assessed the complexity of each of the six environmental sectors by answering the question: What is the level of complexity of each environmental sector?. In both cases, a five-point scale labelled from 1= low to 5= high was used. Sixteen sources of information were selected for the questionnaire based on sources studied in the previous research on environmental scanning, notably in Aguilar (1967), Keegan (1974), Culnan (1983), Preble et al. (1988), Daft et al. (1988) and Choo (1993). The sixteen sources are: customers, competitors, business and professional associates, government official newspapers and periodicals, government publications, broadcast media (radio and TV), industry and trade associations (publications and reports), conferences and trips, superiors and board members, subordinate managers, subordinate staff, internal memorandum and circulars, internal reports and studies, library and electronic information services. Based upon the theoretical and empirical work of Allen (1977), O'Reilly (1982), Culnan (1983) and Choo (1993), perceived source accessibility is defined as the amount of effort needed to locate a source and to get the needed information from that source. Two further questions were designed to measure the perceived source accessibility of each source: How much of your time and effort is needed to approach, contact, or locate each information source? (Answers were indicated on a five-point ascending scale ranging from 1=very great deal to 5=very little), and, after contacting or locating the source: How easy is to get the desired information from that source? (Answers were indicated on a five-point ascending scale ranging from 1=very hard to 5=very easy). The response scores from these two questions are summed into an index of perceived source accessibility of each source. Based upon the theoretical definitions of Saracevic (1975), Zmud (1978), Taylor (1986), O'Reilly (1982), Nilan et al. (1988), Halpern and Nilan (1988), and Choo and Auster (1993), perceived source quality is defined as the perceived relevance and reliability of the information provided by the information source. Relevant information is defined as information that is needed and useful with respect to the goal and activities of the respondent's firm (Auster and Choo 1994) while information has reliability when it is authoritative and dependable (Auster and Choo 1994). The next two questions were designed to measure the perceived source quality of each source: How relevant is the information from each source about the environment? (Answers were indicated on a five-point ascending scale ranging from 1=very irrelevant to 5=very relevant), and How reliable is the information from each source about the environment? (Answers were indicated on a five-point ascending scale ranging from 1=very unreliable to 5=very reliable). The response scores from these two questions are summed into an index of perceived source quality of each source. Amount of scanning is the first dependent variable in this study. Although Hambrick (1979, 1982) measured environmental scanning using frequency, level of interest, and hours spent scanning, this study similar to Choo (1993), Sawyerr (1993), Boyd and Fulk (1996) and Ebrahimi (2000), and asked only about frequency and level of interest: How frequently does information about each environmental sector come to your attention? (Answers were indicated on a five point ascending scale: 1=less than once a year; 2=few times a year; 3=at least once a month; 4=at least once a week; and 5=at least once a day), and, To what extant do you keep yourself informed about developments in each environmental sector? (Answers were indicated on a five point ascending scale that range from 'I generally do not try to keep myself informed about this sector' to 'I try to know everything about this sector'). The second dependent variable is frequency with which each information source is used in environmental scanning. In this study, the respondents were asked to indicate the frequency with which they use each of the sixteen information sources in environmental scanning: How frequently do you use each of the sources to scan the environment? (Answers were indicated on a six point ascending scale: 1=never, 2=less than once a year, 3=few times a year, 4=at least once a month, 5=at least once a week, 6=at least once a day). Of the 94 library and information centre managers of Islamic Azad University, 85 managers returned completed questionnaires (90.42%). Nearly 40% have a bachelor degree, 40% a master, and 10% a Ph.D. On the whole, 85% of respondents' educational field was library and information science and 15% was in other fields. The mean responses and their standard deviations for questions 1 and 2 were calculated and are shown in Table 1. As a group the respondents perceive the customer sector to be the most variable (mean=4.32) and complex (mean=4.26), followed by the technological sector (mean=4.08 for variability and 3.99 for complexity). The socio-cultural sector is placed next in variability and is followed by the economic sector, competition sector, socio-cultural and then economic sector. In variability approach, competition (mean=3.73) and the regulatory sectors (mean=3.52) are perceived less variable. In complexity approach, the regulatory sector (mean=3.58) is perceived as less complex. Then perceived environmental uncertainty of each sector was calculated by the pre-defined formula. The customer, technological and socio-cultural sectors are seen to be the most uncertain, the competition, economic and regulatory sectors are seen to be less uncertain. By implementation of the Perceived environmental uncertainty (means shows in Table 1) formula PEU= PV+PC which is based on previous research and Duncan's (1972) definition, first the perceived environmental uncertainty value was calculated and then the correlation (Pearson's correlation coefficients) of perceived environmental uncertainty with Frequency of information coming to attention and Level of interest in keeping informed was calculated. Results are presented in Table 2. All the correlation coefficients are positive and statistically significant (P≤ 0.01). The correlation coefficients between perceived environmental uncertainty and frequency of information coming to attention range from 0.607 to 0.770, with an average value of 0.682. The correlation coefficients between perceived environmental uncertainty and level of interest in keeping informed range from 0.650 to 0.811, with an average of 0.758. Table 3 shows the mean frequency of use for each information source in scanning the environment by respondents. A high numerical score indicates a high frequency of use. Table 3: Frequency of information source use in environmental scanning. Customers are the most frequently used source followed by the library, newspapers and periodicals, electronic information services, and subordinate staff. All sources were categorized as external or internal and personal or impersonal (shown in Table 4). Results indicated that all internal sources are significantly greater than external, and all personal sources are significantly greater than impersonal sources. To test hypotheses 2, 3 and 4 Pearson's product moment correlation coefficients ('r') are computed between perceived source accessibility, perceived source quality and perceived environmental uncertainty with the frequency of use of information source in environmental scanning (FUISES) for each of the sixteen information sources. As showed in Table 5, correlation coefficients are positive and statistically significant for all information sources with perceived source accessibility and perceived source quality; also seven of them had a positive and statistically significant correlation with perceived environmental uncertainty, seven ones had a positive but statistically not significant correlation, finally for two of them the correlation coefficient is found to be negative. Results show that use of electronic information services (r=0.801), the library (r=0.798), customers (r=0.795), and internal memorandum and circulars (r=0.634) as an information sources in environmental scanning strongly associate with perceived source accessibility; the library (r=0.803), customers (r=0.786), electronic information services (r=0.763), and internal memorandum and circulars (r=0.682) correlate with perceived source quality; and customers (r=0.898) followed by industry and trade associations (publications and reports) (r=0.336), electronic information services (r=0.278), and internal reports and studies (r=0.262) correlate with perceived environmental uncertainty. Findings showed that respondents consider the customer sector to have the highest perceived environmental uncertainty and this result is similar to that found in previous research (Daft et al. 1988; Sawyer 1993; Auster and Choo 1994; May et al. 2000) but the technological and socio-cultural sectors had the next highest perceived uncertainty, which is different from the results of previous researchers. The perceived uncertainty of the technological sector is probably due to the recognition that technology is developing at a rapid pace (Auster and Choo 1994), and in ways that can radically alter operations of libraries and information centres in offering new services, satisfying the users' new and changeable interests, reliance on electronic base information sources and skills in use ofinformation and communication technologies. On the other hand, information is not only a necessary component for well-founded decision making but also for our daily life in society. All human societies have a religion, a spoken language, a kinship system and considerable technology. Edward B. Taylor defined culture as 'The complex whole which includes knowledge, belief, art, morals, law, custom, and any other capabilities and habits acquired by man as a member of society' (as cited in Abraham 2006: 53). As citizens we are dependent on different kinds of information and services to be able exercise our rights and fulfil our obligations as members of society. This information can be provided in various ways but it must somehow be made accessible to everyone. In addition to these civil tasks, there are also a number of other everyday actions that must be done and which could be performed with the assistance of information-based services. A person who does not have the choice of using these services risks missing out on the possible positive consequences of the use and may instead be treated unfairly in, for example, economic, social and political issues. Factors such as position in the hierarchy, language, and occupational and national culture have an influence on the type of issues noticed and identified (Okumus 2004). Ethnic, linguistic and religious variety in population of Iran, a young population that has become university students, religious base of learning and so on are the motivating forces in social and cultural sectors that make it the focus of scanning behaviour of academic library managers. Library books bring about good results for both day-to-day work and education, which is an important agent for developing and changing social life. Libraries give them environmental awareness to adopt our livelihood accordingly. Libraries provide them with political awareness. Libraries help them to know social life and be sociable. Libraries give knowledge and wisdom to society. Libraries also build up knowledge and wisdom to develop the society, etc. Research activity, which is one of the basic roles of higher education, creates a fundamental link between university and society, and in order to satisfy researchers' information needs, academic libraries must be aware of socio-cultural issues and collect information about these issues. Library and information services in Iran are free, and market base sectors such as economic and competitor sectors do not create any challenges for managers of academic libraries, although study about the publishing field by Hosseini (2010) indicates that economic, customer and competitor sectors are perceived as uncertain by managers. According to previous results in Kourteli (2005) and Choo (1993), personal sources of information seem to be used more than impersonal sources. Internal sources of information are used more than external ones and it seems that this result contradicts some of the previous research results such as Aguilar (1967), Keegan (1974), Rhyne (1985), Sawyerr (1993), and Elenkov (1997), who found that organizations rely more on external than internal sources; while it upholds other findings such as O'Connell and Zimmermann (1979),Kobrin et al. (1980), Ghoshal (1988), Preble et al. (1988) and Choo (1993) who found that organizations rely more on internal than external sources. Analysis of the data collected through our questionnaire shows that there is a positive correlation between respondents' perceived environmental uncertainty of each sector and the amount of scanning of that sector (range from 0.6315 to 0.7665). This correlation in technological sector (average = 0.7665) is stronger than other sectors. This result confirms research findings such as those of Choo (1993), Ebrahimi (2000), May et al. (2000), Suh et al. (2004), Abiodun (2009) and Hosseini (2010). On the other hand, we found that perceived source accessibility and perceived source quality are associated more with frequency of use of information source in environmental scanning than is perceived environmental uncertainty; and that the perceived source accessibility's (average = 0.519063) correlation with frequency of use of information source in environmental scanning is stronger than that perceived source quality (average = 0.516313) and perceived environmental uncertainty (average = 0.20375). The conclusion of this study may have some important implications. First, it indicates that libraries are organizations that are sensitive to their external environments and variable, complex and important events occurred in these environments. Second, academic library managers feel uncertainty and complexity in their decision making and rely on information sources; and finally, the use of the library (mean = 4.51) and electronic information services (mean =4.30) as an information sources in environmental scanning are ranked at a considerably higher level than other sources. Libraries are working and a dynamic environment, and managers should scan the external environment for more events. Greater use of library and electronic information services as a result of this study may be due to recognition of managers of the existence and use of these resources. Accessibility and quality of an information source affect using of it by manager. This article has been extracted from Farhadpoor's PhD. Dissertation (2010), entitled "The examination of efficacious factors in environmental scanning for acquisition and use of information by manager of central libraries of Islamic Azad University Units", supervised by Dr. Fahimeh Babalhavaeji, in Department of Library and Information Science, Science and Research Branch, Islamic Azad University, Tehran, Iran. Fahimeh Babalhavaeji is an Associate Professor and Faculty member of Department of Library and Information Science of Science and Research Branch, Islamic Azad University, Tehran, Iran. She received her PhD in Library and Information Science from Science and Research Branch of Islamic Azad University in Tehran. She can be contacted at: f.babalhavaeji@gmail.com. Mohammad Reza Farhadpoor is PhD student of Department of Library and Information Science of Science and Research Branch, Islamic Azad University, Tehran, Iran. He can be contacted at: M.farhadpoor@gmail.com. Abiodun, A.J. (2009). Empirical evidence of executives' perception and scanning of business environment in Nigeria. Buletinul Universitatii Petrol-Gaze din Ploiesti, 61(3), 27-35. Abraham, M.F. (2006).Contemporary sociology: an introduction to concepts and theories. New Delhi: Oxford University Press. Aguilar, F.J. (1967). Scanning the business environment. New York, NY: McGraw-Hill. Allen, T.J. (1977). Managing the flow of technology: technology transfer and the dissemination of technological information within the R&D organization. Cambridge, MA: MIT Press. Auster, E. & Choo, C.W. (1993). Environmental scanning by CEOs in two Canadian industries. Journal of the American Society for Information Science, 44(4), 194-203. Auster, E. & Choo, C.W. (1994). CEOs, information, and decision making: scanning the environment for strategic advantage. Library Trends, 43(2), 206-225. Boyer, E.L. (1990). Scholarship reconsidered: priorities of the professorate. Princeton, NJ: Carnegie Foundation. Boyd, B.K. & Fulk, J. (1996). Executive scanning and perceived uncertainty: a multidimensional model. Journal of Management, 22(1), 1-21. Bryson, J. (1990). Effective library and information centre management. Brookfield, Vermont: Gower. Choo, C. W. (1993).Environmental scanning: acquisition and use of information by chief executive officers in the Canadian telecommunications industry. Unpublished doctoral dissertation, University of Toronto, Toronto, Canada. Retrieved July 19 2010 from http://choo.fis.utoronto.ca/fis/respub/choo.diss.pdf (Archived by WebCite® at http://www.webcitation.org/6Ej6sFK34). Choo, C.W. & Auster, E. (1993). Environmental scanning: acquisition and use of information by managers. Annual review of information science and technology. 28, 279-314. Choo, C.W. (1999). The art of scanning the environment. Bulletin of the American Society for Information Science, 25(3), 13-19. Culnan, M.J. (1983). Environmental scanning: the effect of task complexity and source accessibility on information gathering behavior. Decision Science, 14(2), 194-206. Daft, R.L., Sormunen, J. & Parks, D. (1988). Chief executive scanning, environmental characteristics and company performance: an empirical study. Strategic Management Journal, 9(2), 123-139. Duncan, R.B. (1972). Characteristics of organizational environments and perceived environmental uncertainty. Administrative Science Quarterly, 17(3), 313-327. Ebrahimi, B.P. (2000). Environmental complexity, importance, variability and scanning behavior of Hong Kong executives. International Business Review, 9(2), 253-270. Elenkov, D.S. (1997). Strategic uncertainty and environmental scanning: the case of institutional influences on scanning behavior. Strategic Management Journal, 18(4), 287-302. Ghoshal, S. & Kim, S. K. (1986). Building effective intelligence systems for competitive advantage. Sloan Management Review, 28(1), 49-58. Ghoshal, S. (1988). Environmental scanning in Korean firms: organizational isomorphism in action. Journal of International Business Studies, 19(1), 69-86. Halpern, D. & Nilan, M.S. (1988). A step toward shifting the research emphasis in information science from the system to the user: an empirical investigation of source evaluation behavior, information seeking and use. Proceedings of the Annual Meeting of the American Society for Information Science., 25, 169-176. Hambrick, D.C. (1979). Environmental scanning, organizational strategy and executive roles: a study in three industries.. Unpublished doctoral dissertation, Pennsylvania State University, University Park, Pennsylvania. Hambrick, D.C. (1982). Environmental scanning and organizational strategy. Strategic Management Journal, 3(2), 159-174. Hosseini, E. (2010). Environmental scanning study in acquisition and use of information by the managers of private publishers in Tehran city. Unpublished masters dissertation, Islamic Azad University, Teheran, Iran. Jain, S.C. (1984). Environmental scanning in U.S. corporations. Long Range Planning, 17(2), 117-128. Johnston, R. (1998). The university of the future: Boyer revisited. Higher Education, 36(3), 253-272. Keegan, W. J. (1968). The acquisition of global information. Information Management Review, 8(1), 54-56. Keegan, W.J. (1974). Multinational scanning: a study of the information sources utilized by headquarters executives in multinational companies. Administrative Science Quarterly, 19(3), 411-421. Klein, H.E. & Linneman, R.E. (1984). Environmental assessment: an international study of corporate practice. Journal of Business Strategy, 5(1), 66-75. Kobrin, S.J., Basek, J., Blank, S. & La Palombara, J.L. (1980). The assessment and evaluation of noneconomic environments by American firms: a preliminary report. Journal of International Business Studies, 11(1), 32-47. Kuhlthau, C.C. (1993). A principle of uncertainty for information seeking. Journal of Documentation, 49(4), 339-355. Lawrence, P.R. (1981). Organization and environment perspective. In A.H. van de Ven & W.F. Joyce (Eds. ), Perspectives on organization design and behavior, (pp. 311-327). New York, NY: Wiley. Lester, R. & Waters, J. (1989). Environmental scanning and business strategy. London: British Library, Research and Development Department. Lui, D.R., Shih, M.J., Liau, C.J. & Lai, C.H. (2009). Mining the change of event trends for decision support in environmental scanning. Expert Systems with Applications, 36(2-1), 972-984. May, R.C., Stewart, W.H. & Sweo, R. (2000). Environmental scanning behaviour in a transitional economy: evidence from Russia. Academy of Management Journal, 43(3), 403-427. Nilan, M.S., Peek, R.P. & Snyder, H.W. (1988). A methodology for tapping user evaluation behaviors: an exploration of users' strategy, source and information evaluating. Proceedings of the American Society for Information Science, 25,, 152-159. Nishi, K., Schoderbek, C. & Schoderbek, P.P. (1982). Scanning the organizational environment: some empirical results. Human Systems Management, 3(4), 233-245. Okumus, F. (2004). Potential challenges of employing a formal environmental scanning approach in hospitality organization. Hospitality Management, 23(2), 123-143. O'Connell, J.J. & Zimmerman, J.W. (1979). Scanning the international environment. California Management Review, 22(2), 15-23. O'Reilly, C.A. (1982). Variation in decision-makers' use of information sources: the impact of quality and accessibility of information. Academy of Management Journal, 25(4), 756-771. Preble, J.F., Rau, P.A. & Reichel, A. (1988). The environmental scanning practices of U.S. multinationals in the late 1980s. Management International Review, 25(4), 4-14. Revilla, E., Prieto, I.M. & Prado, B.R. (2010). Knowledge strategy: its relationship to environmental dynamism and complexity in product development. Knowledge and Process Management, 17(1), 36-47. Rhyne, L.C. (1985). The relationship of information usage characteristics to planning system sophistication: an empirical examination. Strategic Management Journal, 6(4), 319-337. Sawyerr, O.O. (1993). Environmental uncertainty and environmental scanning activities of Nigerian manufacturing executives: a comparative analysis. Strategic Management Journal, 14(4), 287-299. Suh, W.S., Key, S.K. & Munchus, G. (2004). Scanning behavior and strategic uncertainty: proposing a new relationship by adopting new measurement construct. Management Decision, 42(8), 1001-1016. Slaughter, R.A. (2003). New framework for environmental scanning. In J. Voros (Ed. ), Reframing environmental scanning: a reader on the art of scanning the environment (pp. 19-37). Hawthorn, Australia: Swinburne University, Australian Foresight Institute. Taylor, R. S. (1986). Value-added processes in information systems. Norwood, NJ: Ablex Publishing Corp. systems. Taylor, R.S. (1991). Information use environments. In B. Dervin & M.J. Voigt (Eds. ), Progress in communication science, (pp. 217-254). Norwood NJ: Ablex Publishing. Thomas, P.S. (1980). Environmental scanning - the state of the art. Long Range Planning, 13(1), 20-25. Tonn, B.E. (2008). A methodology for organizing and quantifying the results of environmental scanning exercises. Technological Forecasting & Social Change, 75(5), 595-609. Worthington, I. & Britton, C. (2000). The business environment. Harlow: Pearson Education. Zmud, R.W. (1978). An empirical investigation of the dimensionality of the concept of information. Decision Sciences, 9(2), 3187-195.